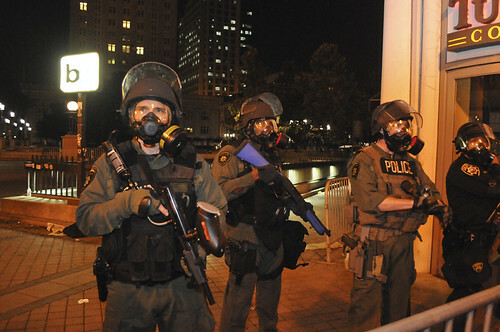 Published on : October 26, 2011 Published by : Gil Riego Jr.
Oakland police in riot gear attempted to disperse protesters gathered at Frank Ogawa Plaza Tuesday night, citing unlawful assembly. During this removal, tensions flared between the Occupy Oakland gathering and police forces. 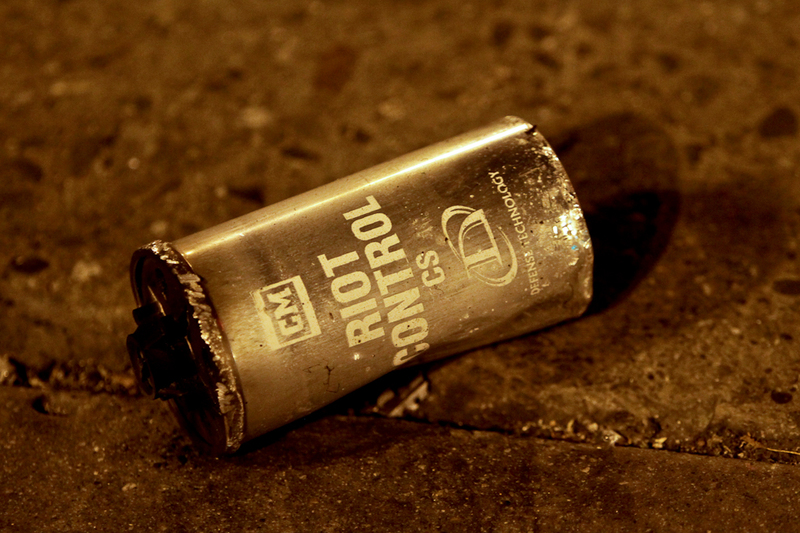 Various reports on Twitter suggested that rubber bullet and bean bag rounds were fired at the protesters, despite claims from Oakland Police that no rubber bullets were used and only four bean bags were fired. BART suspended service to the 12th Street station, and nearby freeway exits were closed. 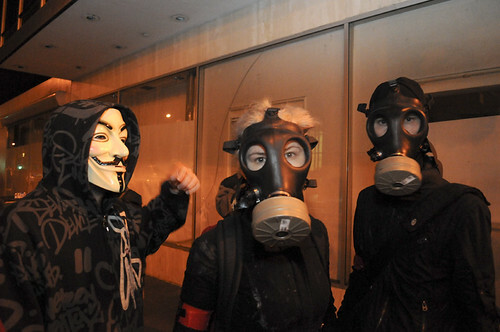 According to photographers on the scene, at least five volleys of tear gas were launched at protesters. Various news outlets report that Mayor Jean Quan, who was in Washington D.C. for The United States Conference of Mayors, is currently en-route back to Oakland to discuss the tactics used by interim Police Chief Howard Jordan. 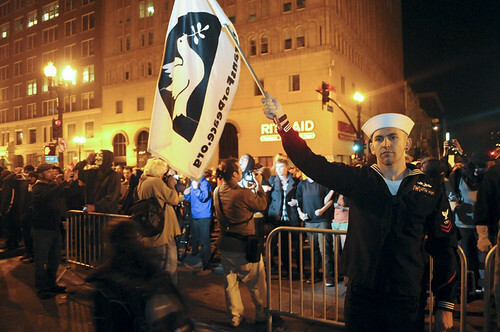 Six-year Navy veteran Joshua Sheperd holds a veterans for peace flag during a demonstration by Occupy Oakland at the intersection of 14th and Broadway Streets in Oakland, Calif. Tuesday, Oct. 25, 2011. Photo by Erik Verduzco. Occupy Oakland protesters gather at the intersection of 19th and Broadway Streets to decide on where to march next during a demonstration in Oakland near Frank H. Ogawa Plaza Tuesday, Oct. 25, 2011. Photo by Erik Verduzco. A protester wears a gas mask after Oakland police officers fired tear gas at the crowd during a demonstration by Occupy Oakland at the intersection of 14th and Broadway Streets in Oakland, Calif. Tuesday, Oct. 25, 2011. Photo by Erik Verduzco. 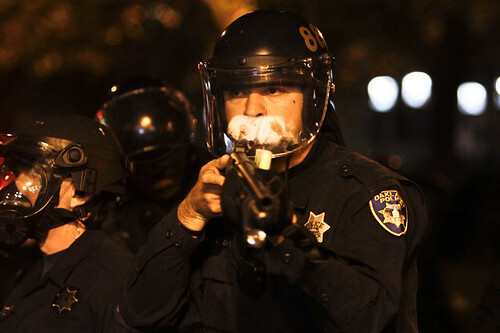 Oakland police officers fire tear gas at protesters with Occupy Oakland during a demonstration at the intersection of 14th and Broadway Streets in Oakland, Calif. Tuesday, Oct. 25, 2011. Photo by Erik Verduzco. 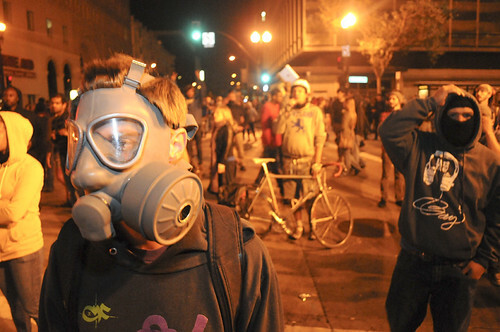 Protesters wear gas masks after Oakland police officers fired tear gas at the crowd during a demonstration by Occupy Oakland at the intersection of 14th and Broadway Streets in Oakland, Calif. Tuesday, Oct. 25, 2011. Photo by Erik Verduzco. 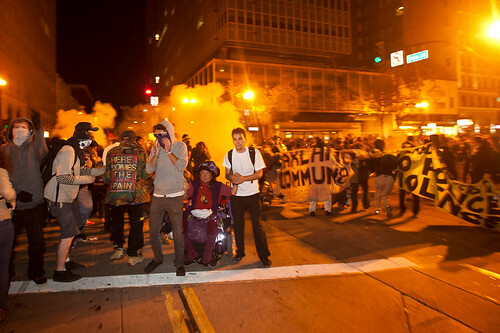 Oakland police officers fire tear gas at protesters with Occupy Oakland during a demonstration at the intersection of 14th and Broadway Streets in Oakland, Calif. on Tuesday, Oct. 25, 2011. Photo by Erik Verduzco. Oakland police officers keep an eye on protesters with Occupy Oakland during a demonstration at the intersection of 14th and Broadway Streets in Oakland, Calif. Tuesday, Oct. 25, 2011. Photo by Erik Verduzco. 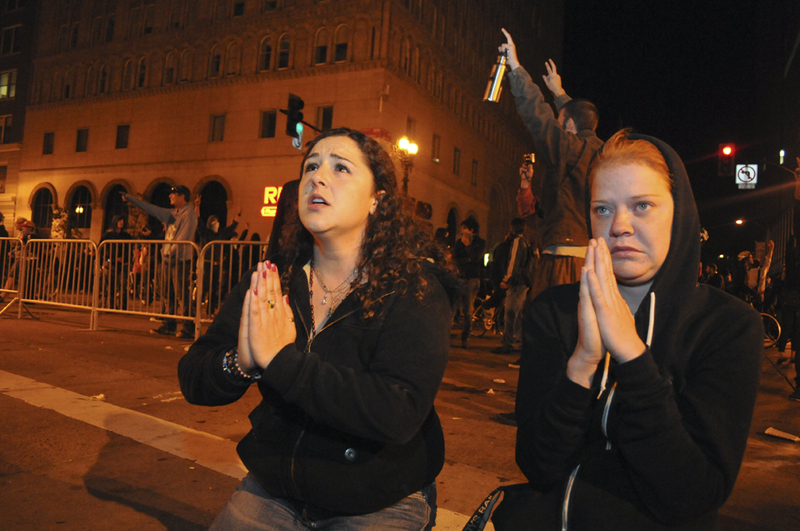 Sofia Chicas, left, and Chelsey Millard, pray during a demonstration by Occupy Oakland at the intersection of 14th and Broadway Streets in Oakland, Calif. Tuesday, Oct. 25, 2011. Photo by Erik Verduzco. A protesters yells at officers during for firing tear gas at protesters during a demonstration by Occupy Oakland at the intersection of 14th and Broadway Streets in Oakland, Calif. Tuesday, Oct. 25, 2011. Photo by Erik Verduzco. 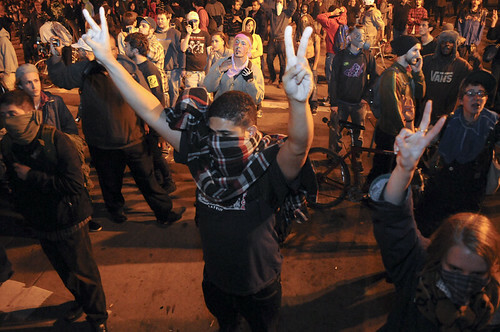 Protesters with Occupy Oakland hold up peace signs during a demonstration at the intersection of 14th and Broadway Streets in Oakland, Calif. Tuesday, Oct. 25, 2011. Photo by Erik Verduzco. 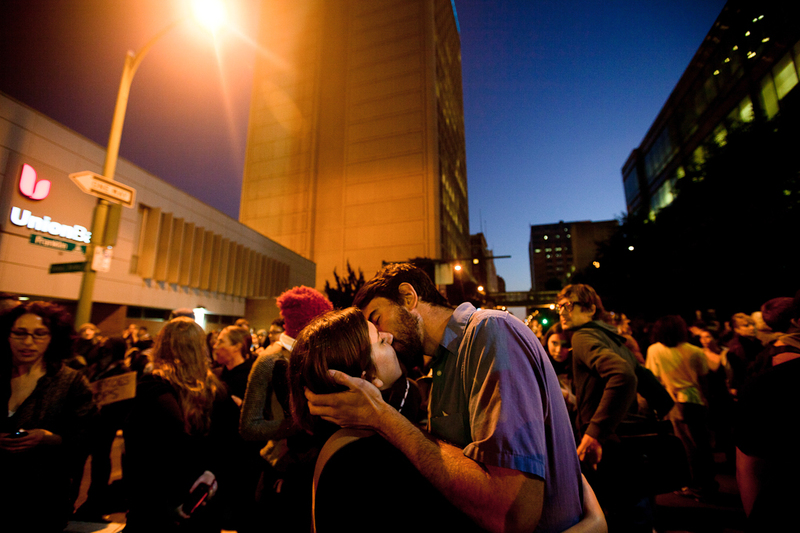 Don Reniff and Chelsea Lohr kiss during a march in protest of the evacuation of the Occupy Oakland encampment in the early morning hours of Tues. Oct. 25, 2011. 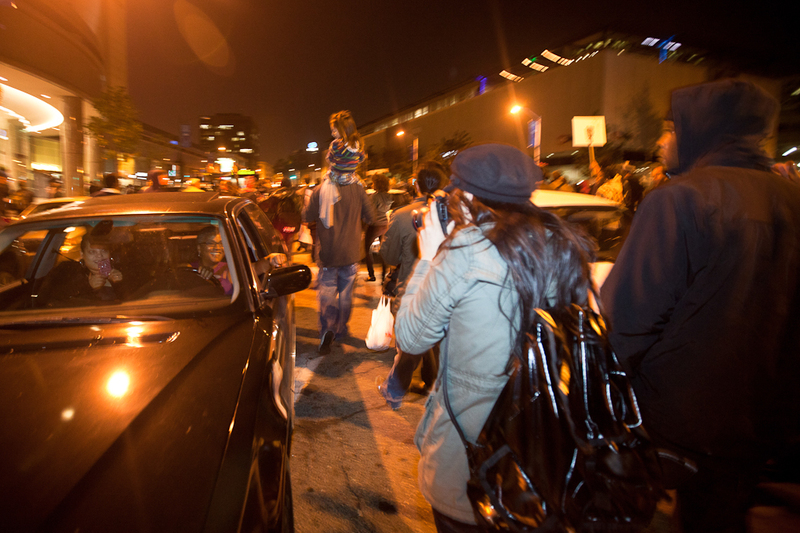 After marching around Oakland for a few hours the protesters were tear-gassed by the police dept. in an effort to get them to disperse. Photo by Elijah Nouvelage. Protesters marching down 20th Street in Oakland meet with smiles from motorists as they swarm into oncoming traffic on Tues. Oct. 25, 2011 The protesters were upset over the evacuation of the two-week old Occupy Oakland encampment in front of City Hall that attempted to bring attention to economic disparity between rich and poor. Photo by Elijah Nouvelage. 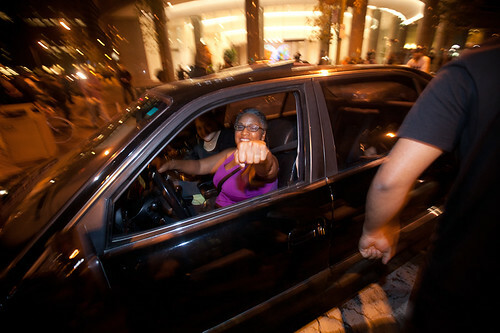 A passing motorist gives a fist bump to a protester marching down 20th Street in Oakland on Tues. Oct. 25, 2011. The protesters were upset over the forced evacuation of the two-week old Occupy Oakland encampment in front of City Hall that attempted to bring attention to the income disparity between rich and poor. Photo by Elijah Nouvelage. 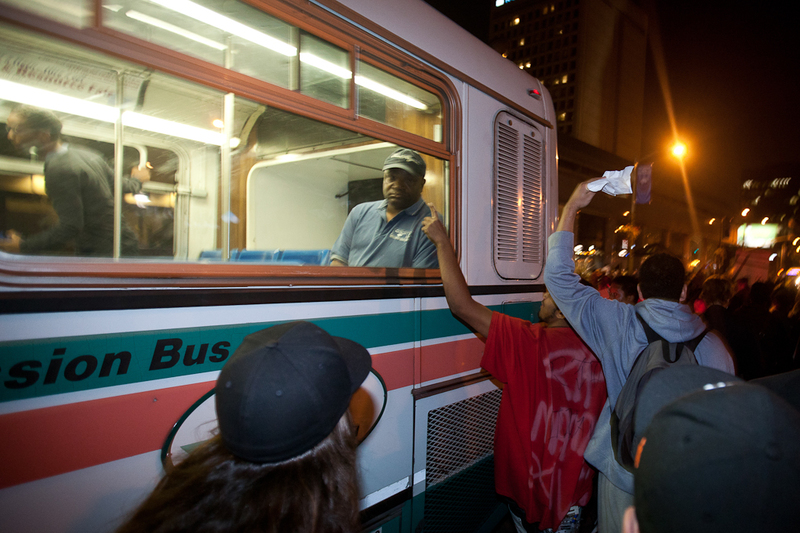 A man watches out of the window of a bus on 20th Street as a large group of protesters pass by. The people were protesting the previous night's evacuation of the Occupy Oakland protesters from their encampment in front of City Hall. Photo by Elijah Nouvelage. An unidentified protester engages with police on Tues. Oct. 25, 2011. Protesters were upset after the Oakland Police forcefully evacuated the Occupy Oakland encampment in front of City Hall that attempted to bring attention to the income disparity between rich and poor in the country. Photo by Elijah Nouvelage. 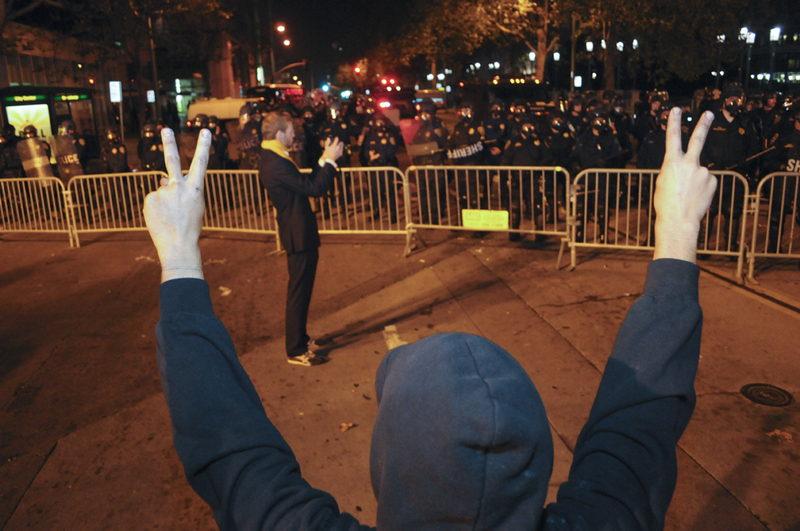 Police officers face off with protesters in front of Oakland City Hall. Protesters were upset after the Oakland Police forcefully evacuated the Occupy Oakland encampment in front of City Hall that attempted to bring attention to the income disparity between rich and poor in the country. Photo by Elijah Nouvelage. Protesters hold hands and chant while facing off with police in front of Oakland City Hall on Tues. Oct. 25, 2011. Protesters were upset after the Oakland Police forcefully evacuated the Occupy Oakland encampment in front of City Hall that attempted to bring attention to the income disparity between rich and poor in the country. Photo by Elijah Nouvelage. 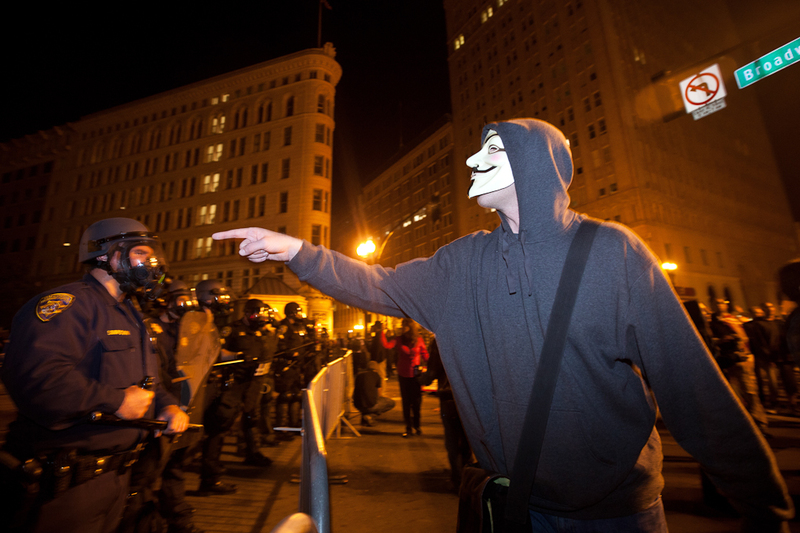 An unidentified protester holds the corner of a banner while facing off with police in downtown Oakland on Tues. Oct. 25, 2011. Protesters were upset after the Oakland Police forcefully evacuated the Occupy Oakland encampment in front of City Hall that attempted to bring attention to the income disparity between rich and poor in the country. Photo by Elijah Nouvelage. Protesters hold hands and cover their faces after having tear gas canisters fired on them in Downtown Oakland on Tues. Oct. 25, 2011. Protesters were upset after the Oakland Police forcefully evacuated the Occupy Oakland encampment in front of City Hall that attempted to bring attention to the income disparity between rich and poor in the country. Photo by Elijah Nouvelage. An unidentified man stands in the street in downtown Oakland after having tear gas canisters fired on him on Tues. Oct. 25, 2011. Protesters were upset after the Oakland Police forcefully evacuated the Occupy Oakland encampment in front of City Hall that attempted to bring attention to the income disparity between rich and poor in the country. Photo by Elijah Nouvelage. 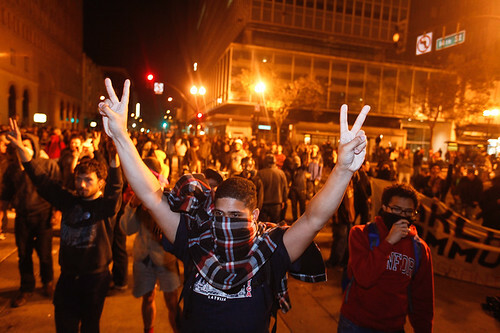 An unidentified man stands in the street in downtown Oakland and makes the peace sign in the direction of a police line on Tues. Oct. 25, 2011. 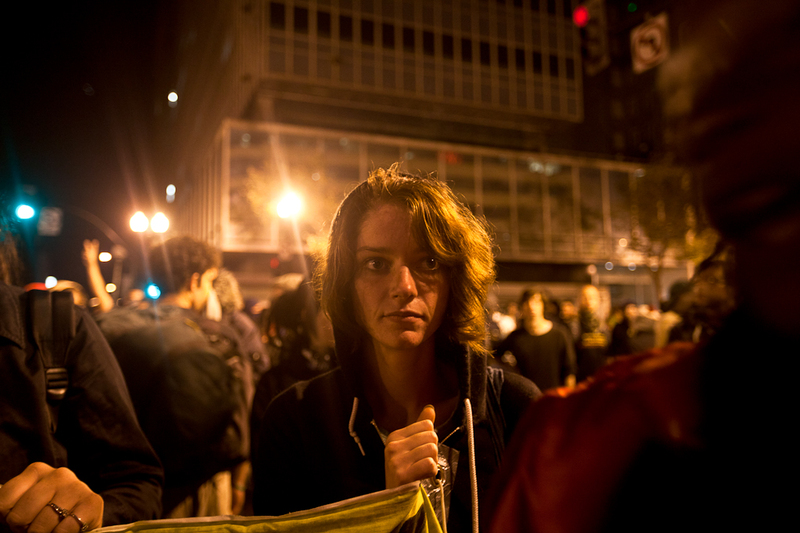 Protesters were upset after the Oakland Police forcefully evacuated the Occupy Oakland encampment in front of City Hall that attempted to bring attention to the income disparity between rich and poor in the country. Photo by Elijah Nouvelage. 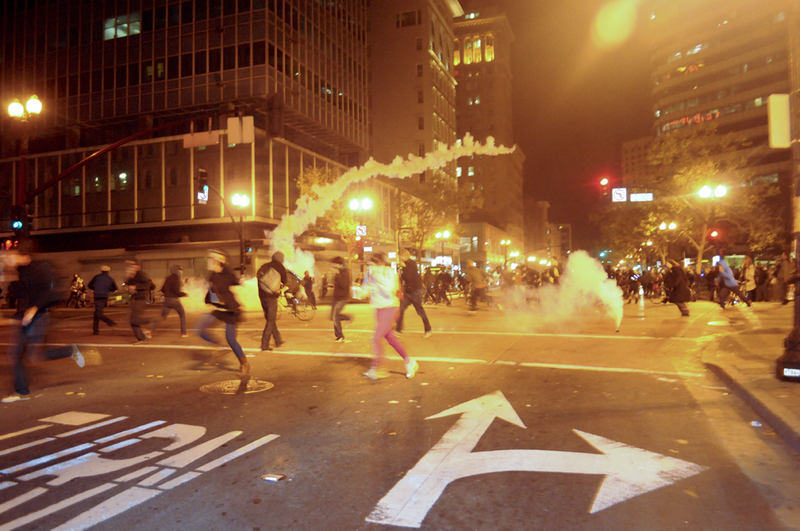 An unidentified police officer fires on a few protesters who remain following a tear gas volley by the police line in front of City Hall in downtown Oakland on Tues. Oct. 25, 2011. Protesters were upset after the Oakland Police forcefully evacuated the Occupy Oakland encampment in front of City Hall that attempted to bring attention to the income disparity between rich and poor in the country. Photo by Elijah Nouvelage. 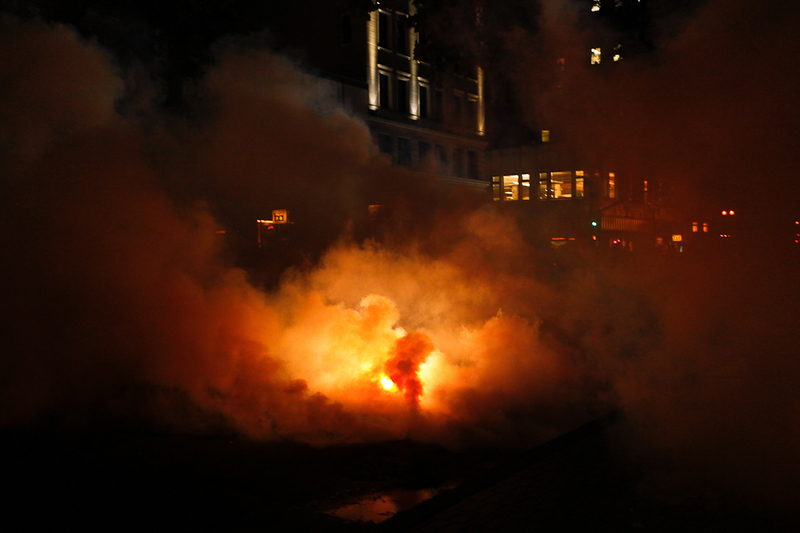 An unidentified woman on a bicycle ducks to avoid getting shot with pepper balls after the police line at 17th and Broadway fired tear gas at protesters. Protesters were upset after the Oakland Police forcefully evacuated the Occupy Oakland encampment in front of City Hall that attempted to bring attention to the income disparity between rich and poor in the country. Photo by Elijah Nouvelage. 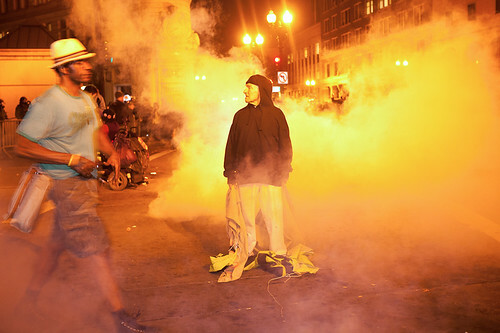 Svend Larose covers his mouth but holds his ground after being tear-gassed by police on Tues. Oct. 26, 2011 in downtown Oakland. 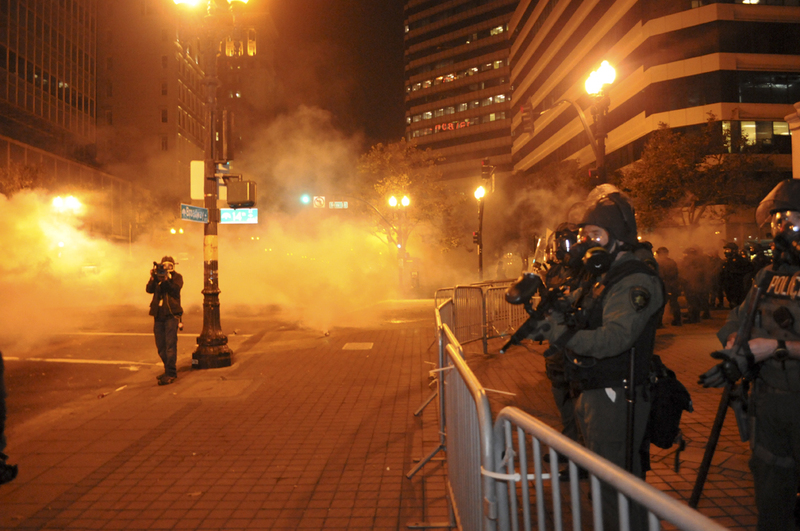 The Oakland Police tear-gassed protesters five times over the span of a few hours. 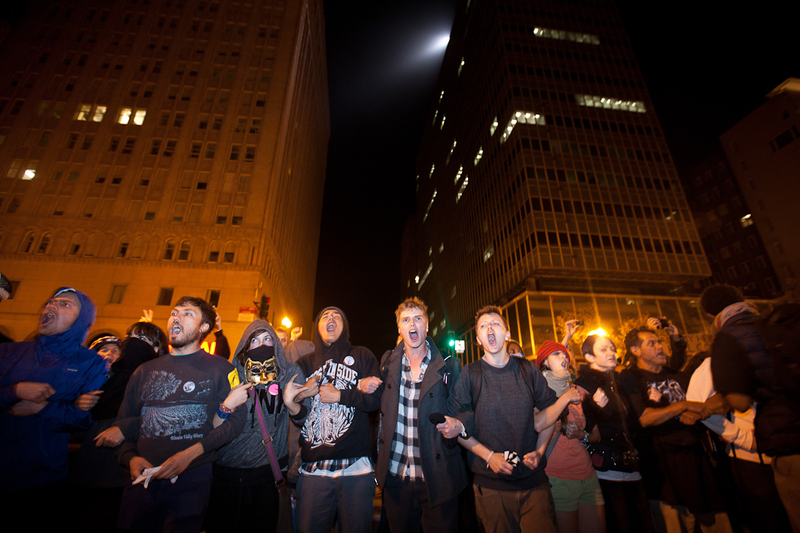 The protesters were upset after the Oakland Police forcefully evacuated the Occupy Oakland encampment in front of City Hall that attempted to bring attention to the income disparity between rich and poor in the country. Photo by Elijah Nouvelage. Svend Larose hands off a bottle of water to a woman rushing to the aid of a fallen protester during the Occupy Oakland protest on Tues. Oct. 26, 2011. The Oakland Police Dept. tear-gassed the protesters five times over the span of a few hours. Protesters were upset after the Oakland Police forcefully evacuated the Occupy Oakland encampment in front of City Hall that attempted to bring attention to the income disparity between rich and poor in the country. Photo by Elijah Nouvelage. An unidentified man sits down after being tear-gassed by police on Tues. Oct. 25, 2011. 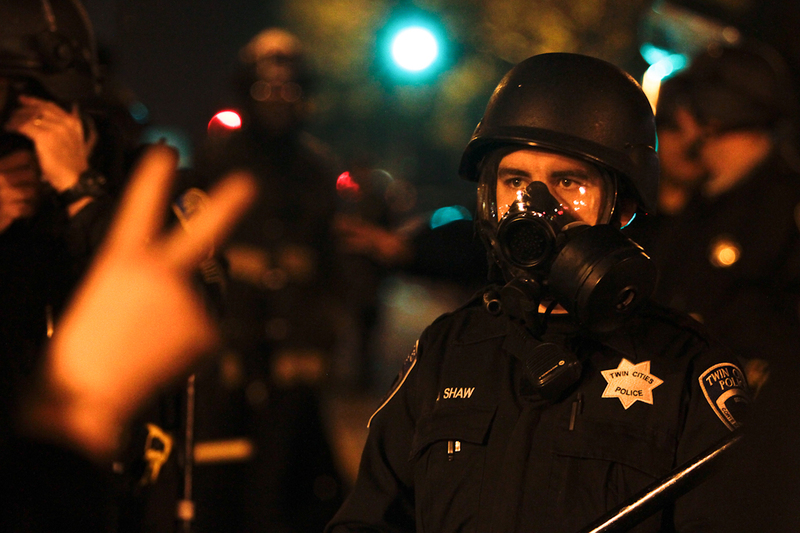 The Oakland Police tear-gassed protesters five times over the span of a few hours. 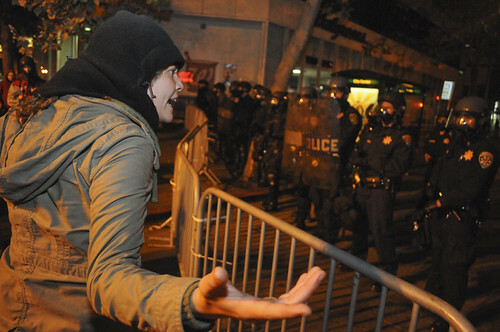 The protesters were upset after the Oakland Police forcefully evacuated the Occupy Oakland encampment in front of City Hall that attempted to bring attention to the income disparity between rich and poor in the country. Photo by Elijah Nouvelage. Tear gas smoke billows out of a canister on Broadway in downtown Oakland on Tues. Oct. 25, 2011. 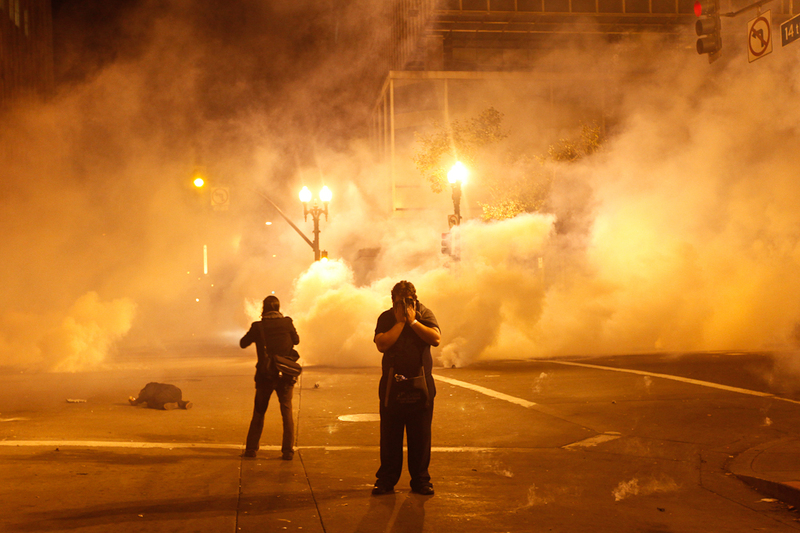 The Oakland Police tear-gassed protesters five times over the span of a few hours. The protesters were upset after the Oakland Police forcefully evacuated the Occupy Oakland encampment in front of City Hall that attempted to bring attention to the income disparity between rich and poor in the country. Photo by Elijah Nouvelage. 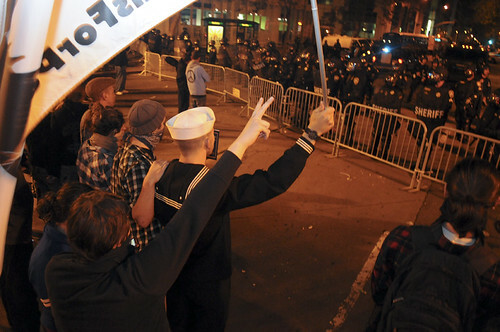 An unidentified Oakland Police officer points a gun at protesters during an Occupy Oakland march on tues. Oct. 25, 2011. The Oakland Police tear-gassed protesters five times over the span of a few hours. 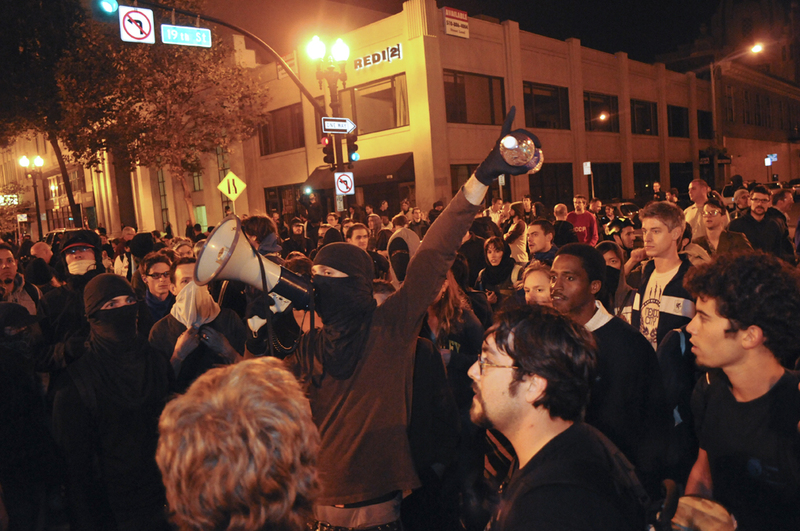 The protesters were upset after the Oakland Police forcefully evacuated the Occupy Oakland encampment in front of City Hall that attempted to bring attention to the income disparity between rich and poor in the country. Photo by Elijah Nouvelage. 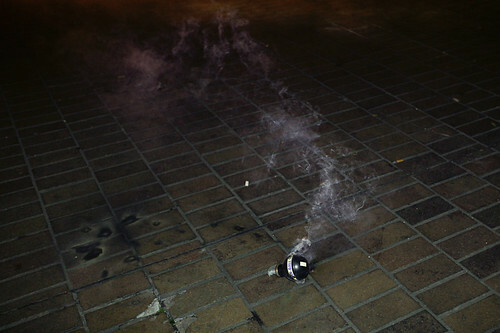 An empty tear gas canister lies in the street in downtown Oakland on Tues. Oct. 25, 2001. The Oakland Police tear-gassed protesters five times over the span of a few hours. 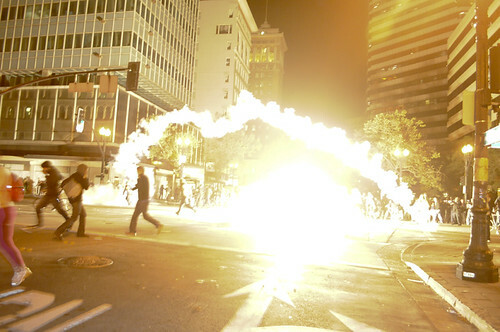 The protesters were upset after the Oakland Police forcefully evacuated the Occupy Oakland encampment in front of City Hall that attempted to bring attention to the income disparity between rich and poor in the country. Photo by Elijah Nouvelage. 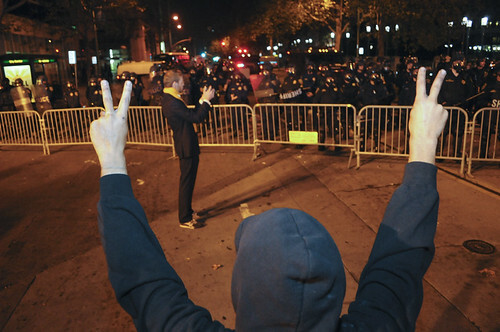 A protester makes a peace sign at a police officer in downtown Oakland on Tues. Oct. 25, 2011. 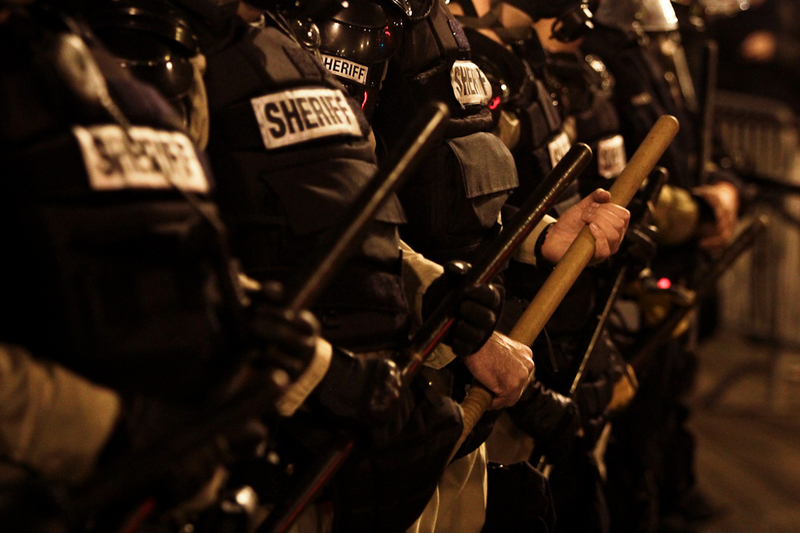 The police tear-gassed protesters five times over the span of a few hours. 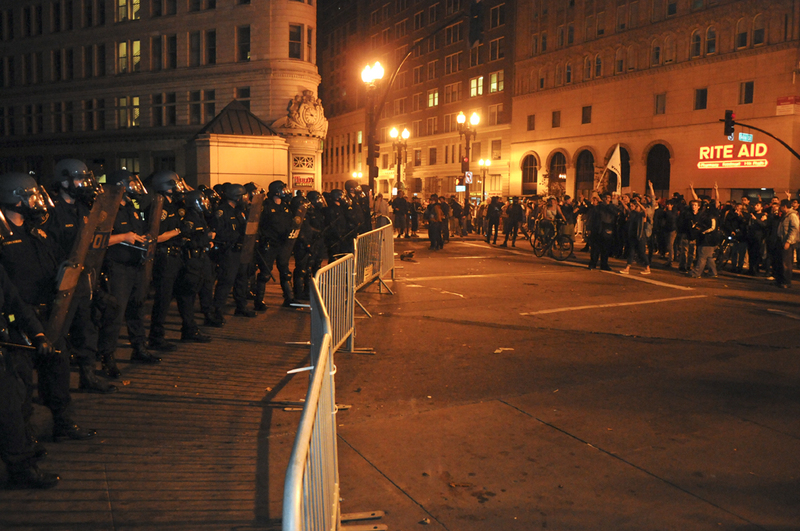 The protesters were upset after the Oakland Police forcefully evacuated the Occupy Oakland encampment in front of City Hall that attempted to bring attention to the income disparity between rich and poor in the country. Photo by Elijah Nouvelage. Police hold batons while holding their line in front of Oakland City Hall on Tues. Oct. 25, 2011. The police tear-gassed protesters five times over the span of a few hours. The protesters were upset after the Oakland Police forcefully evacuated the Occupy Oakland encampment in front of City Hall that attempted to bring attention to the income disparity between rich and poor in the country. Photo by Elijah Nouvelage. 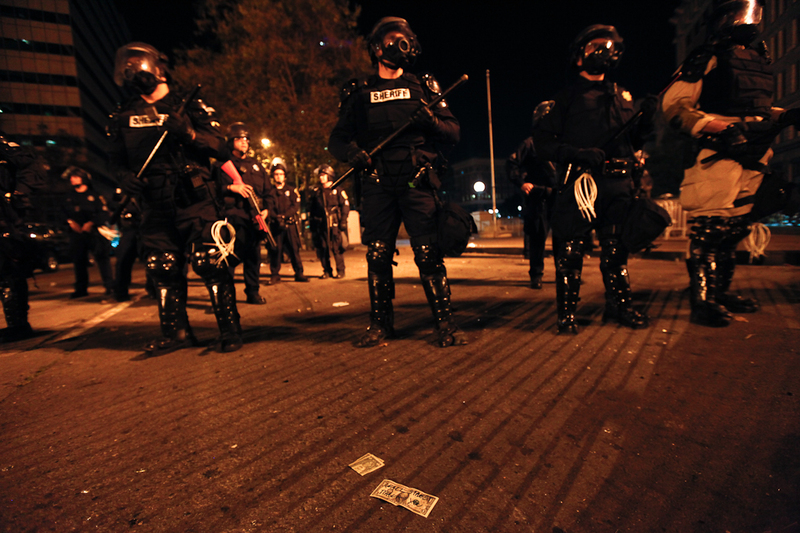 A dollar bill with the words "Wall Street thanks you" lies on the street in front of a line of police officers in downtown Oakland on Tues. Oct. 25, 2011. 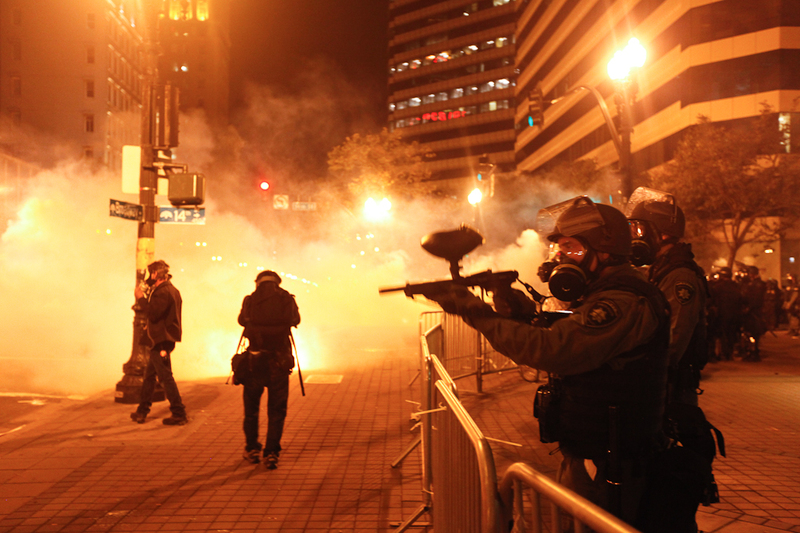 The police tear-gassed protesters five times over the span of a few hours. 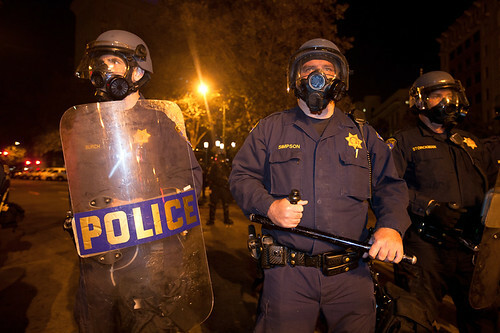 The protesters were upset after the Oakland Police forcefully evacuated the Occupy Oakland encampment in front of City Hall that attempted to bring attention to the income disparity between rich and poor in the country. Photo by Elijah Nouvelage. An empty flash-bang grenade continues to smoke on a sidewalk in downtown Oakland on Tues. Oct. 25, 2011. 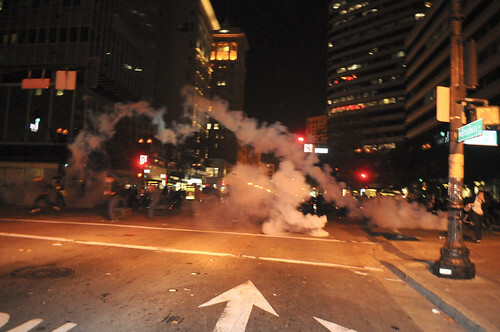 The police tear-gassed protesters five times over the span of a few hours. The protesters were upset after the Oakland Police forcefully evacuated the Occupy Oakland encampment in front of City Hall that attempted to bring attention to the income disparity between rich and poor in the country. Photo by Elijah Nouvelage.